LET'S TALK ABOUT MENTAL HEALTH, LAURIER! Mounting academic pressures, uncertainty around career paths, transitioning to adulthood, or relationship breakdowns. Any of these scenarios can lead to the onset of a mental health issue for post-secondary students. A study by the Canadian Association of College and University Student Services (CAUCUSS) in 2013 showed that more than 50 per cent of students surveyed reported feelings of hopelessness, while just over 60 per cent experienced overwhelming anxiety. Left unacknowledged and untreated, mental health issues can carry serious ramifications. A wide range of resources – from campus departments to peer groups – are available at Laurier to promote and maintain good physical, mental, and emotional wellbeing. Launched in the fall of 2015, SafeHawk is a free app for iPhone, Blackberry, and Android devices that connects users to phone helplines such as Good2Talk, Here24/7, and other community-based mental health resources in Kitchener-Waterloo, Brantford, and Toronto. With locations at the Waterloo and Brantford campuses, the Accessible Learning Centre (ALC) provides academic support and resources to students with psychological disabilities. Services offered through the ALC include assistive technology, alternative formats for exams or assignments, note-taking, tutoring, and peer support. Students must register with the ALC to receive accommodations. 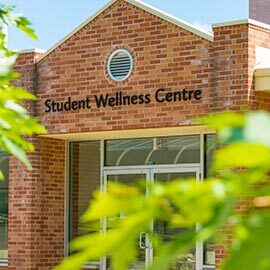 The Brantford Campus Wellness Centre is open Monday – Friday, 8:30 a.m. – 4:15 p.m. Located on the 2nd floor of the Student Centre, the centre offers personal counselling, appointments with a family physician, and psychiatry assessments by referral. The Waterloo Student Wellness Centre is open Monday – Wednesday, 8:30 a.m. – 7:30 p.m., Thursday – Friday, 8:30 a.m. – 4:15 p.m. Located on the 2nd floor of the Student Services Building on the Waterloo Campus, the centre offers personal counselling, appointments with a family physician, and psychiatry assessments by referral. The Delton Glebe Centre is a holistic counselling facility run by the Waterloo Lutheran Seminary that serves both the Laurier and external community. Laurier students are leaders when it comes to promoting dialogue around mental health. A variety of student-run groups and projects are active at Laurier’s Brantford and Waterloo campuses, providing peer-to-peer support and mental health awareness. The Mental Health Education Group at Laurier’s Brantford campus is currently working on a community-wide campaign to reduce the stigma associated with mental health. A book, filled with personal accounts and experiences with mental health, will serve as a tangible asset to demonstrate how widely mental health can impact a community. Email csle@wlu.ca to share your story. The Mental Health Education Group at the Waterloo campus organizes an annual 12-hour walk in the quad, where students, staff, and faculty can share experiences with mental illness and listen to inspiring guest speakers. Peer Connect is a student committee that addresses mental health by promoting a balanced lifestyle. The group, active at the Brantford and Waterloo campuses, runs an anonymous phone line for students as a resource for information and support. Peer health educators are a dedicated group of students at Laurier’s Brantford and Waterloo campuses who promote the physical, emotional and psychological health through programs, campaigns and presentations. Organized in the fall and winter terms by the Graduate Students Association, Wellness Week offers a variety of free programming for graduate students that includes massage therapy, reflexology, therapy dogs, bake sales, yoga, and drumming circles.